It is a crisp, June morning in 2016 when I board a ferry bound for Powell River, on the Upper Sunshine Coast. As the vessel departs, the familiar, low rumble of its motor is suddenly accompanied by something far more melodic—the sounds of musical instruments readying for performance. Throughout the indoor seating area at the ship’s bow, half a dozen violinists are interspersed among the crowd, tuning their pegs to a precise pitch while making conversation with passengers. On the starboard side, a group of clarinetists practices tricky passages, their synchronicity unstirred by the ship’s sway. Nearby, three flautists play breathy scales, warming up their lungs as their fingers dance lightly upon the silver instruments. Following the ferry’s safety announcement, the musicians—members of the Strathcona Symphony Orchestra—take centre stage in the makeshift concert hall, with the ship’s bow windows behind them. In small ensembles, they take turns playing well-known classical pieces, such as St. Anthony Chorale and Scheherazade, and standards like Red Rose Polka, entertaining the hundreds of passengers on the way to Powell River’s prestigious Pacific Region International Summer Music Academy (or PRISMA) Festival. The backdrop rivals that of the greatest theatres in the world—the wild, west coast mountains blanketed with lush greenery and topped with snow, and the dark ripples of the Salish Sea, broken up by islands and the ship’s turbulent wake. The musicians play on, and I sit back to enjoy the unique, harmonious ferry ride. Every year, on one designated day in June, BC Ferries passengers travelling from Comox to Powell River are treated to a special concert like this. Known as the Symphony Cruise, it is an experience that is open to everyone on board. For many passengers, it is a welcome surprise, a pleasant way to pass the time during the hour-and-a-half crossing. But for others, those who know about PRISMA and its world-class musicians, this floating performance serves as a melodic appetizer before the main course—a matinee concert at Powell River’s Evergreen Theatre, given by the PRISMA Festival Orchestra. Part academy, part festival, PRISMA is an intense, two-week training program for advanced students of all ages wanting to pursue professional careers as musicians. It was conceived by Arthur Arnold, who serves both as PRISMA’s music director and also as the chief conductor of the Moscow Symphony Orchestra. 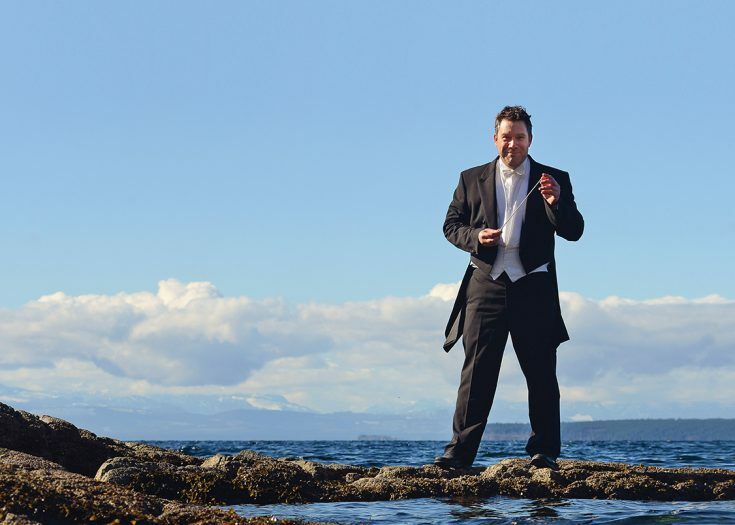 Hailing from the Netherlands, Arnold first visited Powell River in 2000 as an orchestra conductor with an orchestra from Seoul that was there for the town’s choral festival, the International Choral Kathaumixw (a Coast Salish word meaning “a gathering together of different peoples”). He returned to that festival the following year and chatted with Kathaumixw organizers about the possibility of adding an orchestra academy, a conversation that led to the development of the Symphony Orchestra Academy of the Pacific (SOAP), the precursor to PRISMA that ran from 2004 to 2012. Arnold also met his wife, a Powell River resident, around that time, sealing his commitment to the festival on the Pacific coast. The pair spends part of the year in the Netherlands, with Arnold travelling to and from Moscow, and the summer months in Powell River, where he can focus on growing PRISMA. It’s already attracting top-notch talent; each year, hundreds of aspiring musicians from North America, South America, Europe and Asia apply to the program. “The recognition [of PRISMA] on the worldwide musical scene and among major institutes like Julliard and the Eastman School of Music is great proof of the quality of the program. We get applicants from these institutes every year,” Arnold says. The musicians who attend PRISMA participate in master classes, private lessons, chamber ensembles and the festival orchestra, working with internationally lauded guest artists and instructors. Over the course of those two weeks in June, the students, sometimes sharing the stage with the guest artists, perform a series of concerts that attract more than 5,000 music-lovers from Powell River and beyond. The enthusiasm is abundantly evident all over town—during the run of the program, many local businesses and homes even sport colourful homemade signs. “Welcome, PRISMA!” they read, in bold, cheerful letters. This local support, coupled with the financial assistance of individuals and corporations, has helped PRISMA—a non-profit, charitable organization—continue to improve on its programming and grow its audience. BC Ferries was proud to partner with PRISMA as a title sponsor in 2016, with a three-year commitment. Every year on the day of the Symphony Cruise, BC Ferries also offers a special 5:15 p.m. departure time from Powell River’s Westview terminal, to ensure an optimal afternoon for passengers attending PRISMA’s matinee concert (the regular departure time is 8:45 p.m.). PRISMA is expanding its marketing to establish a fan-base in Vancouver, as well. Several PRISMA travel packages are available featuring concert tickets, overnight accommodation and return ferry from Horseshoe Bay to Powell River and the Sunshine Coast via Gibsons, Sechelt, Earls Cove and Saltery Bay. Powell River is also accessible by way of a 25-minute flight. Following my own music-filled journey to Powell River, I join more than 400 of my fellow Symphony Cruise passengers and hundreds of other concert-goers at the Evergreen Theatre to take in PRISMA’s 2016 matinee concert. We listen to Rimsky-Korsakov’s spirited Introduction and Wedding March from Le Coq d’Or and Beethoven’s impressive Triple Concerto for Violin, Cello and Piano in C Major, and, after the first movement of the triple concerto, we let out a collective sigh, awed by the skill of the soloists. Following intermission, the 75-piece orchestra rattles the auditorium’s beige walls with Shostakovich’s tempestuous Symphony No. 5, and everyone in the audience gives the performers a lengthy standing ovation, which leads to an encore from Tchaikowsky’s The Nutcracker. Soon, it’s time to board the ferry for the return trip to Comox. On board, the atmosphere radiates a sense of quiet satisfaction. Some passengers close their eyes, perhaps reliving the music; others speak in hushed voices in contrast to the morning’s exuberant crossing. Halfway through the journey, the ship is reinvigorated – an orca is paying a visit about 15 metres from the ferry. We crowd to the outer deck and rush to the windows to watch the orca in its solo recital. It leaps once, then again, and again, and it’s gone.